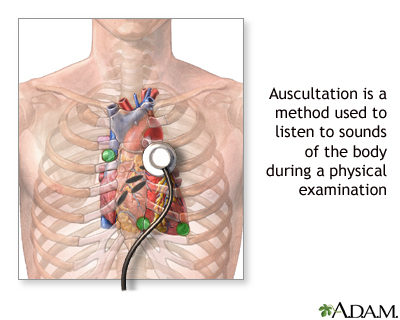 Auscultation is listening to the sounds of the body during a physical examination . Dorland's Online Medical Dictionary. Available at: www.dorlands.com/def.jsp?id=100010441 . Accessed June 1, 2015. Goldman L. Approach to the patient with possible cardiovascular disease. In: Goldman L, Schafer AI, eds. Goldman-Cecil Medicine . 25th ed. Philadelphia, PA: Elsevier Saunders; 2015:chap 51.